Last time I updated my OpenJDK packages there was a ton of critical bugfixes which had been applied by the IcedTea community – fixes which Oracle had not yet added to its own version of Java. 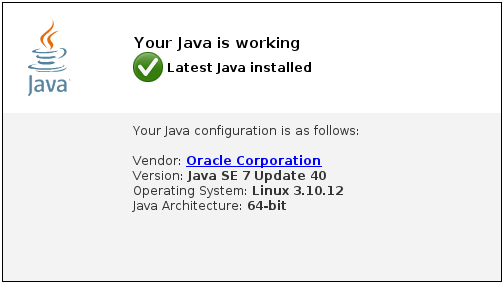 That version of OpenJDK called itself “Java7 Update 40 Build 31” aka openjdk-7u40_b31. It took a while for Oracle to release its own 7u40 release – as you know Oracle uses OpenJDK as the base upon which it builds its binary releases of Java SE, but the company sometimes does not respond to critical holes as fast as the IcedTea developers do. - Cleanup file resources properly in TimeZone_md. - Cast should use same type as GCDrainStackTargetSize (uintx). Optional: If you want a Java browser-plugin you must install icedtea-web which I also updated a couple of days ago (OpenJDK itself does not contain such a plugin). Posted: 23 September, 2013 in Slackware, Software.